There is a moment in J. R. R. Tolkien’s trilogy where his fellowship is faced with the daunting task of traversing the underground mines of Moria. Once a noble and industrious empire of dwarves, Moria now is reduced to something dark and dreadful. Following the leadership of the wizard Gandalf, the company of travelers seek to move quickly and quietly through the darkness— yet without a map. The wisdom of Gandalf, who normally possesses a level of omniscience, manifests itself when he admits he does not know exactly how to proceed. Facing such darkness, he counsels that before “we make up our minds we ought to look about us.” Not seeing many options, the wizard determines that the fellowship should “go towards that light in the north door.”Some text with a footnote.1 Following the light, however faint, proves essential to their successful navigation, not only through the mines, but also to the achievement of their overarching quest—to see evil destroyed and the return of their King. In the real world of the twenty-first century, I liken the Christian’s sojourn through our culture very much to that of the fellowship’s journey through the mines. That our culture trends toward that which is dark and dreadful is no surprise or cause for panic, but knowing how, as Christians, to live and move within it, in order to achieve our overarching quest, is often difficult and discouraging. What is needed are regular sources of light—well placed windows shining at the right time and to the right degree. These windows, in turn, allow us who live in the darkness to see, understand, and move more freely in the direction of godliness. Second Peter 1:19 is one of many places in the Bible reminding us that the Word of God functions as a lamp shining in a dark place for the express purpose of illuminating the Christian traveler’s path until “the day dawns and the morning star rises.” As pilgrims on a dangerous quest traveling through a world that is not our own, we have been given regular access to light. In this illuminating spirit, I welcome you to the most recent issue of the Journal for Biblical Manhood and Womanhood. Our hope is that the articles contained herein will serve as clarifying commentaries on cultural trends and what the Word of God has to say about them. Christians are not meant to traverse this world alone; we need one another and require the wisdom that comes from traveling in a fellowship. What is more, light gleaned is meant to be light shared (Matt 5:14–16). Often the clarity one receives from another is the very gospel truth that transfers others from the domain of darkness into kingdom of the Son’s light (Col 1:13). This is our aim and hope for the Journal. Following the essays and studies, this issue contains a sermon on 1 Peter 1:3–7, “God’s Design for Marriage,” by Matthew Barrett, senior pastor of Fellowship Baptist Church in Riverside, California, which celebrates gender distinction. And finally, the Journal concludes, as is our regular practice, with several thoughtful reviews by Matthew Arbo, Josh Philpot, Alex Carr, Megan Hill, Andrew Walker, and Godwin Sathianathan. We are grateful for their helpful presentations of recent volumes of interest to our readers. 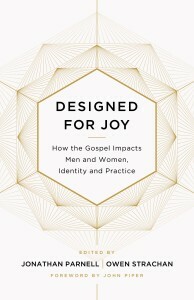 As a long time reader of JBMW, I count it a significant honor now to take the editor’s baton and run with a skilled and dedicated team at the Council on Biblical Manhood and Womanhood. The dedicated labors of Denny Burk for the last seven years, and Pete Schemm before him, has made JBMW what it is today, and it is a joy to continue along the trail they have blazed with such light. Special thanks are extended to Assistant Editor David Schrock for bringing his editing skills, careful eyes, and discerning heart to this issue as well as to Mathew Sims for his efforts in creating the newly designed format. Finally, thanks to you, our readers. We treasure and value your comments, requests, and submissions and hope your support will continue as you benefit from and are encouraged by the thoughts and research that we have assembled for you. As I mentioned above, perhaps the most rewarding thing a writer for JBMW could hear is that someone has benefited from his work and then shared it with another. If you find anything of help within these pages, please take the time to pass it along and help shine the light of gospel truth. Tolkien’s fellowship, searching for help in a dark corridor, found a faint source of light, and by it were able to move forward in their quest. May this Journal aid you in doing the same—until evil is destroyed and the return of our King. 1. J. R. R. Tolkien, The Fellowship of the Ring, Book 2, Chapter 5.